In 2015, Tim Leeper Roofing was named National Roofing Contractor of the Year. This is something that everyone here is proud of and works to live up to every single day. 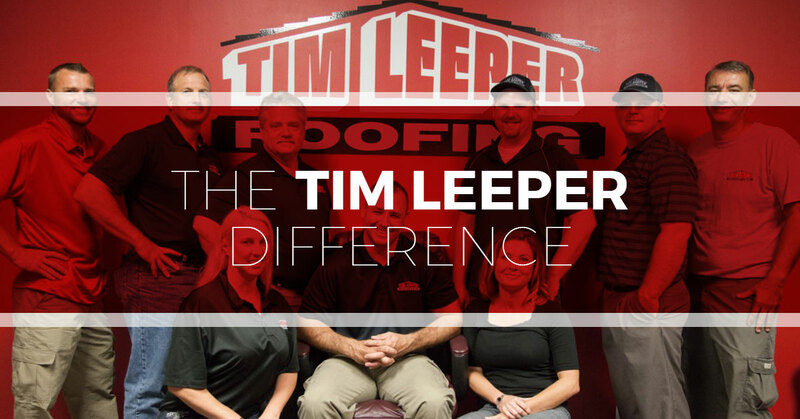 We work to be different than the rest of the roofing crowd, and we’d like to take this opportunity to break down who we are and what makes up the Tim Leeper Difference. We are a roofing contractor. We are not a general contractor who does some roofing work. We specialize in roofing and know the ins and outs of the business. We’ve been in business since 2004, and we founded Tim Leeper Roofing to have a business that was committed to customer satisfaction and quality work to the extent that we just were not seeing in other roofing companies in the area. At the heart of our company, you will find customer service that is in turn rooted in our values. We consider integrity and community to be fundamental values that we can manifest in our work. We call Old Hickory home, and we think the idea of community is something that each one of us contributes to on a daily basis with the way we treat each other. We try to treat each and every person we come across as part of our community as if they were part of our family or church. On every project, we take into account our customers desires, their goals, and their needs. We have a good reputation in the area. We have worked hard to earn people’s trust, and we know that a reputation has to be re-earned every day and on every job. Our labors are founded in our mindset of professionalism. We all have certain expectations when it comes to working with a company, and we try to exceed our customer’s’ expectations when it comes to respect and professionalism. One way we live out our values is through the customer service that our sales representatives give. Our salespeople will work with you to find the best service and product for you. They will walk you through the process and will check back with you to make sure you are satisfied with our work. Our customer service extends to our workers who, if they need to enter your home, will wear booties to make sure they don’t track in dirt. Part of customer service package is fast service. In many cases, we will be able to replace your entire roof in just one day. From the contract details to dealing with your insurance company the business side of our roofing business is determined to give the absolute best service. Our roofers too, pride themselves on attention to detail. During a roof tear-off, we don’t hammer down old nails. To make sure your new roof is installed over a smooth surface, we pull each and every nail out. Also, we always use ice and water underlayment in valleys and along seams to prevent water damage and ice dams. We ensure that every roof has proper ventilation. It doesn’t matter if a roof shingle install is perfect if the roof doesn’t have proper ventilation, the roof will collect condensation, which leads to rotten wood and damage to the roof decking, and can even endanger your family’s health. A roofing job isn’t when the last shingle is hammered in place. Only when the roof has been blown clean and the ground around your home is cleared of every trace of the project do we consider the job done. We use rakes and magnets to get every last nail and scrap of shingle. Plenty of roofing companies train their employees on active job sites. That can mean that new roofers make mistakes on your roof, and this can lead to problems down the road. At Tim Leeper Roofing, we have an indoor mock roof that we maintain as our training area so our roofers go out on the site well trained. Hire great employees who share our commitment to our values. We do background checks and drug test on every employee. This is just a fancy way of saying that no job is too small or too big. You can call Tim Leeper Roofing for the smallest issue, or for a large scale roof replacement, and we’ll be there offering the superior service we always offer. If you have a small, humble home or a mansion, we will perform our roofing job with the same professionalism. Whether you have a home that needs a roof repair or replacement or a commercial flat roof that needs resealing or a total tear-off and replacement, Tim Leeper Roofing can handle it. We do pitched roofs and flat roofs: shingles, flat roof EPDM coatings, and metal roofs. When you need roof repair or a total roof replacement, be sure to call us to get the Tim Leeper difference.